Human Rights Council urges Ukraine to ensure rights of Russian prisoners | Russian Legal Information Agency (RAPSI). 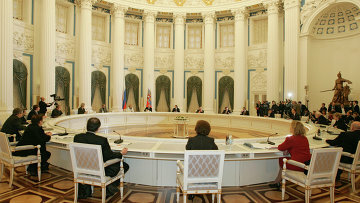 MOSCOW, February 5 (RAPSI) - The Presidential Council for Human Rights has appealed to Ukraine’s ombudsman Lyudmila Denisova asking to do her best in a bid to ensure the rights of Russians held in Ukrainian detention centers and prisons in accordance with international law principles and requirements, a statement published on the advisory body’s website reads. The request has been forwarded to Denisova in relation to the information on a Russian citizen’s death in a Ukrainian prison. According to Russia's authorized representative of the Contact Group on the peaceful settlement of the situation in eastern Ukraine Boris Gryzlov, examination conducted as part of a case over the death of Russian national Valery Ivanov in a Lviv prison showed that the man had died from tortures.